As a somewhat regular flyer, I had always been intrigued by the concept of wearing a head-mounted display for some immersive in-flight entertainment. However, I never really found the "cinema" part of existing "personal cinema" headsets pervasive at all. Watching a tiny video through those headsets is like sitting in the last row of an empty theater. I'm not going to pay $800 for that. Then came the smartphone-powered VR headsets, but their three-degree-of-freedom (3DoF) tracking for just the head was never precise enough for prolonged usage. 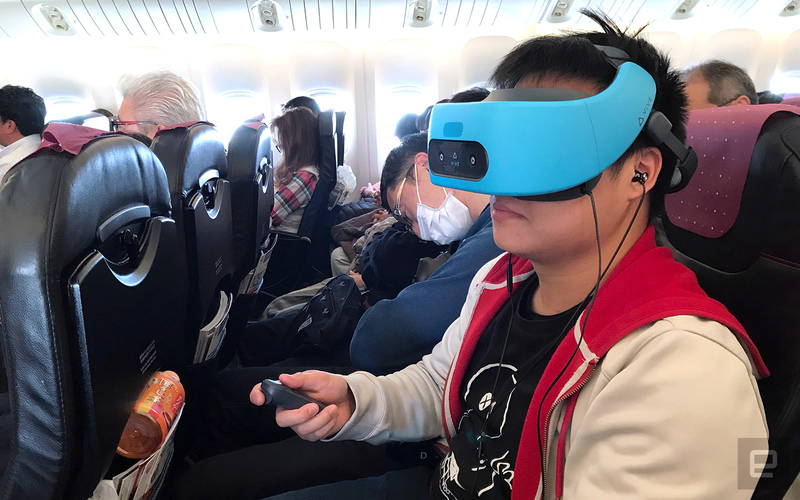 It wasn't until the Vive Focus, HTC's $630 standalone 6DoF VR device for China (about $100 of which goes to local taxes), that I finally decided to give virtual reality a chance to prove itself as a worthy alternative to those in-flight touchscreens. Luckily for me, my wife didn't forbid me from bringing this bright blue headset to our vacation, as long as it would fit into my carry-on. Thankfully, the device isn't as bulky as it looks. With the back support band folded in, the headset takes up about the same amount of space as my DSLR kit plus a flash unit, so even a regular-size camera shoulder bag will accommodate it. If I slip the headset into my backpack with its pair of inside-out tracking cameras facing downward, I still have plenty of space for its wireless controller plus my hoodie. Luckily, the backpack still fits under the seat in front of me on economy-class journeys. Many flights these days allow the use of portable electronic devices even during takeoff, provided that they are set to airplane mode. Normally, I'd be watching a video on my smartphone or tablet soon after getting on a plane, but for my first flight with my Vive Focus, I decided to put on this headset right before the plane took off. And that was how I came across a fundamental flaw of the device. I was getting familiar with the futuristic-space, port-like world and menus of Vive, but as soon as the plane left the ground, I could see myself drifting away from the virtual platform. It was almost like I was flying in the virtual world, and as fun as this sounds, it was a little freaky, as it was out of my control. If you have a fear of heights, you definitely won't want to try this. This issue persisted until the plane was no longer ascending. I later faced the same issue when the plane was descending, except this time I sank into the virtual ground instead. Any sudden turbulence would also cause the virtual world to drift a little. According to HTC, such acceleration or deceleration would indeed confuse the 6DoF sensors on the Vive Focus, but it's now looking into letting users switch to 3DoF tracking so that they can at least watch videos or navigate around menus during takeoff and landing. Such a "vehicle mode" would also let us use the headset with ease while taking other transportation. My experience was otherwise smooth. 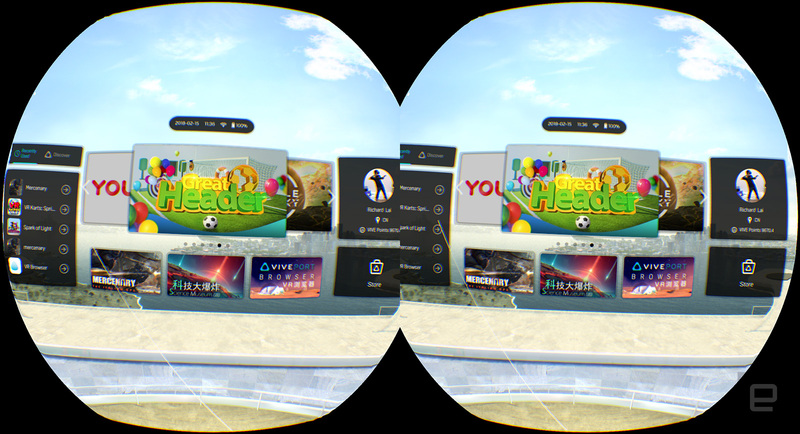 I spent a good amount of time watching my preloaded videos -- with my earphones plugged in, of course -- using the Moon VR Player, which has better file compatibility than the default video-player app. It also supports both conventional and 360-degree videos. Not that I would watch 360-degree videos on a plane, of course -- at least not in economy class, where people can see me. Unlike the "personal cinema" headsets, I could use the controller to pull the virtual screen closer to me -- imagine gazing at a 55-inch TV from just two feet away -- and even reposition it when my seat was reclined. And of course, with the sharp 2,880 x 1,600 AMOLED screen backed by 6DoF tracking, it really felt as if I was inside a cinema with an IMAX-like screen, especially that one time when I nodded off to Blade Runner 2049 on an early flight and then woke up confused as Ryan Gosling walked through a deserted city on my massive virtual screen. For a second, I forgot that I was still on the plane. There were, however, moments when it was obvious that I was looking through a pair of lenses. Like most other higher-end VR headsets (including the Oculus Rift and Windows Mixed Reality devices), the Vive Focus uses Fresnel lenses, which consist of ring-shaped prism facets. This is in order to drastically reduce weight and space, but it's not perfect. While the rings are usually not that apparent when placed right in front of our eyes, part of them does light up when the screen displays high-contrast images, mainly due to the reflective nature of the grooves between the rings. This can become rather distracting while watching an intense, dark movie scene; but then again, this is a common issue among the current crop of high-end VR headsets. I don't recall taking the Vive Focus off due to discomfort or nausea after extended usage, as long as its back support band was positioned in a way such that my head wasn't leaning on it. I also made sure that the interpupillary distance for the two lenses was optimal to begin with -- there's a slider for that on the bottom right side -- to keep everything in focus. 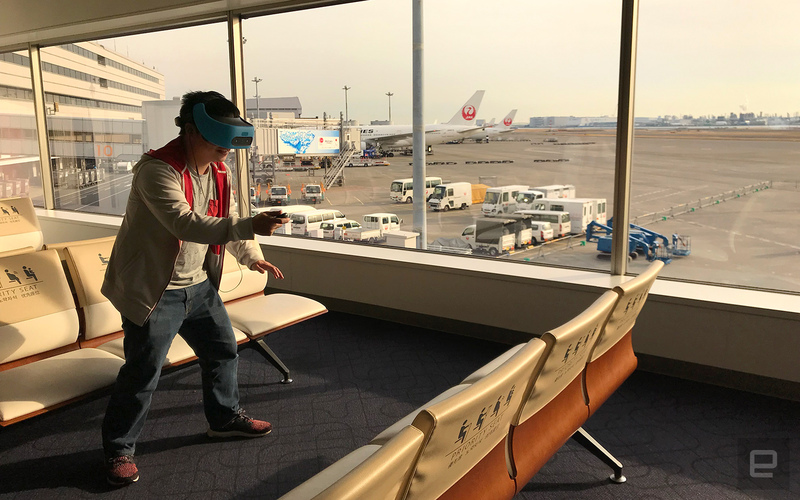 While a typical 3DoF VR headset would usually last for mere minutes before I had to take a break, the Vive Focus could easily stay on my head for at least 15 to 20 minutes during my flights, with breaks for food, drinks or toilet between each session. With that in mind, the three-hour battery life was plenty for my four-hour flight between Hong Kong and Tokyo, let alone some shorter domestic flights in Japan. Plus, I could keep it charged while using it. Of course, it would be a waste to just watch videos on the Vive Focus. After all, this is the first 6DoF VR headset that doesn't need to be powered by a PC. The question here is whether the 6DoF tracking would also make a notable difference for other seated VR experiences, like gaming, while on a plane. More importantly, I was curious as to how careful I would have to be with my movements to avoid disturbing my neighbors. To be honest, the Vive Focus didn't offer many apps optimized for a seated user, which is understandable given that its main selling point is "world-scale" tracking. Its Viveport app library is still growing -- it had a little under 50 apps at the time of writing -- but that's not to say I didn't have fun with the few games I came across. In general, the best titles required relatively little body movement, so at no point did I have to worry about bumping into nearby passengers. 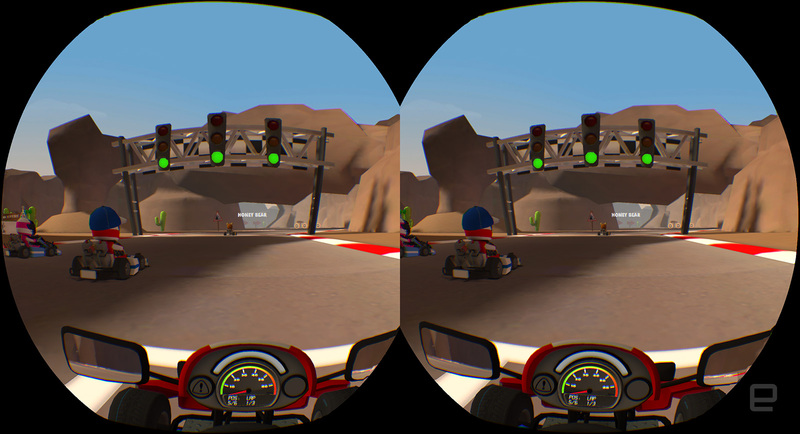 Even for a racing game like VR Karts: Sprint, the steering was handled by merely twisting the wrist that held the controller, so my elbow was barely a threat to the passenger on my right. Similarly, in Fancy Shooter, I could aim ninja stars at fruits by just looking at them and then click on the controller to fire. I didn't even need to move my head much in Super Puzzle Galaxy unless I wanted to take a closer look at the puzzles, but that was when I became mindful of not getting too close to my neighbor's knee. 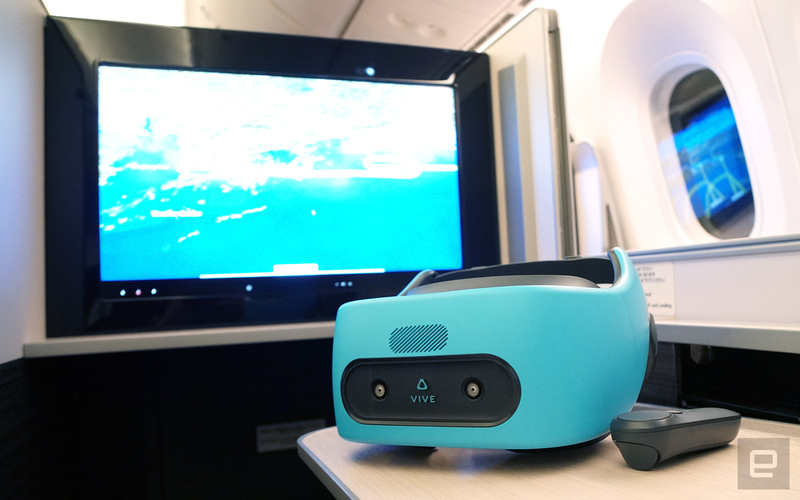 Despite the small body movements while seated, the Vive Focus' 6DoF tracking was still key to making the whole VR experience enjoyable over a longer period on my flights. In contrast, if I were to use a 3DoF headset such as a Samsung Gear VR or a Google Daydream View, I could probably watch videos just fine, but it wouldn't last long due to the less natural feel from the head-only tracking: The virtual world wouldn't respond to my leaning forward, backward or sideways. It's the same with their games, even though they do offer a larger collection. It would also be hard for me to go back to the lower display resolution on those headsets. Does the Vive Focus make a good travel companion? I'm hooked. Once I'm locked into my own VR world, the immersive experience far outweighs what other people may think of me wearing this blue headset in public -- although I would still pick the white version personally. It's just nice to have an IMAX-like cinematic experience all to myself. But is this the ultimate replacement for the conventional in-flight entertainment systems? There are some clear advantages, including the fact that you can throw a good number of high-quality movies that you would actually watch onto a microSD card, plus the VR games are bound to be more fun than the in-flight games, if any. Sure, you can get similar results with a Gear VR or Daydream setup, but that would mean making do with 3DoF tracking plus a lower display resolution, and together they would make my flights even more tiring. Of course, there's always space for improvement for the Vive Focus, and that's also assuming that you could get hold of a unit in the first place. The fact that it's still limited to the Chinese market means it's missing out on the absolute latest videos from the likes of Google Play and Netflix, so until someone figures out a way to slap Daydream onto this Vive Wave-based device, you'll have to source your videos elsewhere. It would also be nice if someone could make a music player with a great visualizer for the headset, which may help users relax while traveling. The device does need more 6DoF VR games optimized for a seated user, but that's less of a concern for me. With developers claiming they've been able to port their games from other VR platforms to Vive Wave in just three hours, hopefully the Vive Focus' library will continue to grow. 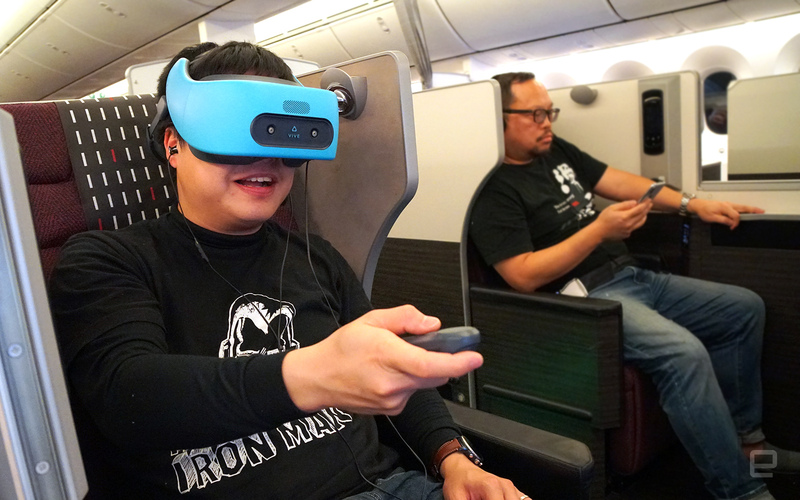 That said, the Vive Focus sets the benchmark for in-flight VR entertainment.